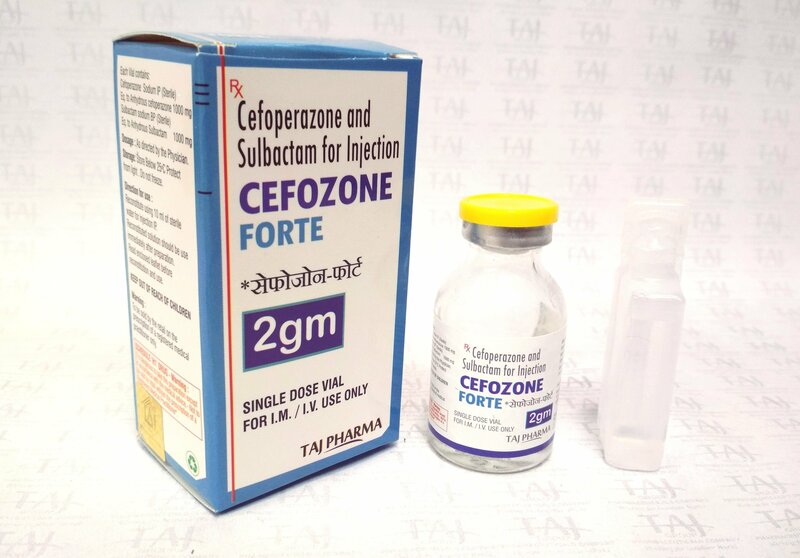 About Cefoperazone Sodium A third generation cephalosporin antibiotic, Parenteral antibiotic. Mechanism of Action of Cefoperazone Sodium Cefoperazone is a 3rd generation cephalosporin which exerts its bactericidal action against both gram positive & gram negative organisms by inhibiting bacterial cell wall synthesis. Cefoperazone inhibits transpeptidase & thus prevents cross linking of bacterial cell wall. Transpeptidase & associated proteins constitute various types of specific binding proteins which have affinity for cephalosporins like Cefoperazone. It has greater action against pseudomonas & has good action against salmonella typhi & B.fragilis Pharmacokinets of Cefoperazone Sodium Absorption: Orally not well absorbed & should be given parenterally, Distribution: widely distributed & good CSF penetration, Metabolism: It is not significantly metabolized inside the body. Excretion: Excreted mainly through bile & a small portion is excreted in urine. A small amount is seen in breast milk. Indications for Cefoperazone Sodium + Sulbactam SodiumIt is a combination of third generation Cephalosporins Cefperazone sodium and Beta-lactamase inhibitor Sulbactam. 1.Pain after I.M. injection & thrombophlebitis after I.V. injection. Use with caution.Old Age Related Information May be used.Breast Feeding Related Information Use with caution.Children Related Information Use with caution. Interactions for Cefoperazone SodiumAlcohol: Disulfiram like reaction up to 72 hours after cefoperazone intake. Aminoglycosides (Gentamycin, Tobramycin): Nephrotoxicity of aminoglycosides potentiated. Oral anticoagulants: Hypothrombinemic effect potentiated, bleeding complications may occur. Bacteriostatic agents like Chloramphenicol: Decreases efficacy of Cefoperazone sodium. Probenecid: Slows tubular excretion and this enhances efficacy. Frusemide & Ethacrynic Acid: Potentiate nephrotoxicity of Cefoperazone Sodium. Lab. Test: Urine Glucose: False positive with Benedicts solution and Fehlings solution. Direct Coomb?s Test: False positive. Urinary 17-Ketosteroid values: Falsely elevated values. Typical Dosage for Cefoperazone Sodium Adults: 1g to 2gm I.M. or I.V. two times daily to three times daily. Store in a refrigerator & away from light.Effects of Missed Dosage of Cefoperazone SodiumTake the missed dose as soon as noticed and if it is the time to take the next dose then skip the missed dose. About Sulbactam SodiumAn irreversible ?-lactamase inhibitor, To increase the antibacterial activity of penicillins and cephalosporins against ?-lactamase?producing organisms.Mechanism of Action of Sulbactam SodiumSulbactam has no significant antimicrobial activity, despite sharing the ?-lactam ring that is characteristic of beta-lactam antibiotics. This similarity in chemical structure helps the Sulbactam to act as a competitive inhibitor of beta-lactamase enzyme secreted by certain bacteria that are resistant to beta-lactam antibiotics. This inhibition restores the antibacterial activity of beta-lactam antibiotics against ?-lactamase-secreting resistant bacteria.It is usually given in combination with Amoxycillin. It is used to increase the antibacterial spectrum of penicillin and cephalosporin against penicillinase-producing and beta-lactamase-producing organisms such as Staphylococcus aureus, H. flu, Moraxella catarrhalis that are resistant to Ampicillin alone.